So what makes Berjaya so unique and attractive to its guests? Well, which other resort would have over 400 luxury chalets spread over 70 acres of land area, many of which are within the lush rain forests and others right on the sea water. Berjaya is located at the far end of Burau Bay. So why stay near the water when it's possible to stay right on it. 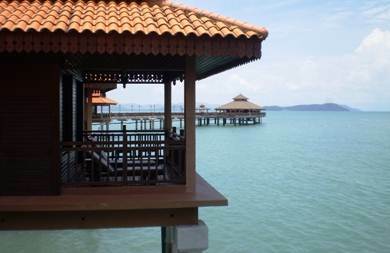 That's the theme which Berjaya projects to those who love to be closest to the water. And for others, there are many superb chalets that are nestled in the deep rainforest. The only sound you get there are the chirping of the birds and only thing that you see there are the lush green nature's bounty. All the chalet are tastefully built with elegance and luxury. The architecture and the interior designs combine modern with old charm. A perfect blend in a forested area that leads down to the waterfront. There are pathways through the entire landscape of the resort and much part of it passes through the rainforest of mount Mat Cincang. You can either choose to walk between facilities or wait for a battery operated cart to come to pick you up and drop you wherever you want. 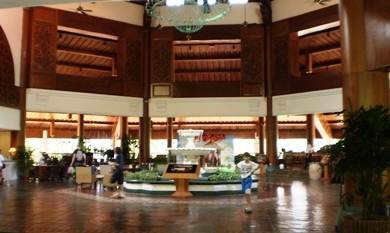 In fact after you check in at the main lobby, you will be transported to your chalet in a cart. These carts keep moving around and you can either hop on or off, or call up the front desk and ask for one from your chalet. As you pass through the pathway, you will see many different birds and even many small wild animals like squirrels, monkeys etc. The entire resort accommodations are in chalets. And there are different types of chalets. Many of them have great views of the Andaman Sea. Of course the Premier Chalets and suites are right on the water and offer panoramic view of the bay. Out of the total of 409 chalets, 47 are built on the sea with stilts and have private balconies on the water with cushioned easy chairs to enjoy the views. 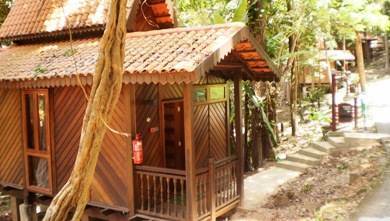 The Rainforest Chalets are deeply nestled in the jungle and built in traditional Malay architecture with modern touch. These are ideal if you want to spend a quiet time with the nature. And when you feel hungry or want to be with all the actions and activities, just come out and take a cart. There are Rainforest Studios and Suites as well. Other types of accommodations includes the Junior Suites on water, Executive Suites on water, Family Chalet which are formed by interconnecting two chalets in the rainforest through a common door etc. There are also Sea View Chalets that are also on the water but in a row behind the Premier Chalets. Although they don't have sweeping views like the Premier ones, they too have lovely setting on the water and along the boardwalk. 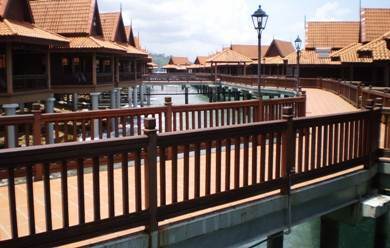 One of the highlights in Berjaya is its Pahn Thai Restaurant which is located right on the middle of the water and accessible through a boardwalk from the seafront. There can not be a more romantic dining when you consider that the restaurant not only offers an all round views of the ocean, but also has the majestic Mat Cincang Mountain in the background to add to the awesome view and ambience. It serves excellent Thai cuisine. Other than the superb Pahn Thai Restaurant, there are several other dining options in the premises. Dayang Cafe serves local and international dishes with 24 hours dining service. Oriental Pearl offers Canton and Sichuan cuisine. The Beach Restaurant located on the private beach serves Indian, Italian and western cuisine. There are some great lounges with bars in Berjaya. The Lobby Lounge is located in the main lobby area and offers a range of cocktails and non-alcoholic beverages along with live musical entertainment in the evenings. The Rimba Lounge offers a full bar, dart, pool table, internet access, large screen projection of sports etc. Visit Nightlife in Pantai Kok to get details about these lounge bars with pictures. Berjaya offers many different kinds of amenities and recreational activities. Ayura spa offers many different massages & treatments. Additionally there are facilities offering yoga, a jungle gym, sauna, swimming pool with whirlpool bath etc. Kids club and kids playground. Sports facilities like beach volleyball, beach soccer, table tennis, fooseball, dart, pool table, outdoor tennis, paintball, archery etc. 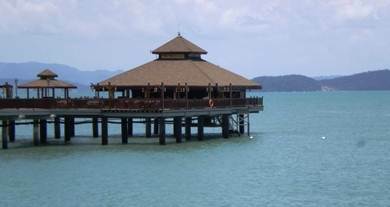 Berjaya organizes activities like jungle trekking, island tours, mangrove tours, day & sunset cruises, boat tour to Pulau Payar Marine Park etc. Organized watersport activities on Burau Bay and other water areas like water ski, jet ski, snorkeling, scuba diving, windsurfing, parasailing, sailing, banana boating, kayaking etc. Other amenities in the resort includes free wifi access, cyber cafe with broadband internet access, library room, meeting rooms, gift & souvenir shops, shuttle service to town & night markets, baby sitting service, foreign currency exchange etc. Update March 2015: The resort now offers free guided nature walk to explore the flora and fauna of the 160 million years old rainforest in which the resort is located. The free walking tour takes place in the morning and evening. Youwill walk along the shaded pathways in the resort area. Update February 2019: Berjaya has recently launched a luxury yacht which can be chartered by guests staying at the resort. 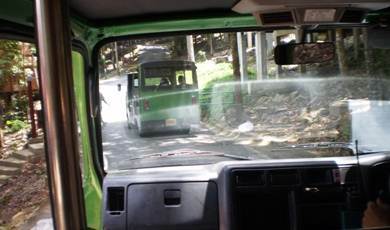 It has a capacity of 20 persons (maximum up to 30) along with 13 crew members. This 48-metre luxury motor yacht has been built in Japan. A private chef and butler would be on board. There are 4-hour sunset cruises, full day (8 hour) sightseeing cruises and even overnight (24-hour) cruises offered. Wedding and special functions can also be held on the yacht. Berjaya Resort is located at the end of Burau Bay of western coast in Pantai Kok in an isolated area and along the slope of mountain Mat Cincang with stunning views of Andaman Sea. Will Berjaya Resort, being a far off place create problem in our visits throughout the island. Can we get cabs all the time there for our trips to Cenang beach, underwater world, shopping etc? Berjaya is quite isolated. The hotel reception can call taxi or arrange transport for you. Taxis are not always available there. If Cenang beach, shopping etc are your priority, then Berjaya is a wrong choice. 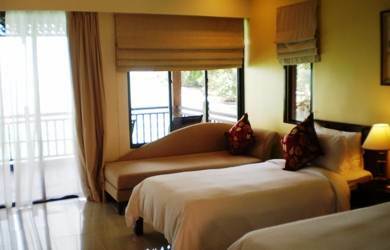 It's good for those who like to remain within resort area, enjoy rainforest and the water views. Cable car and Telaga Tujuh (Seven Wells) waterfalls are of course quite close.